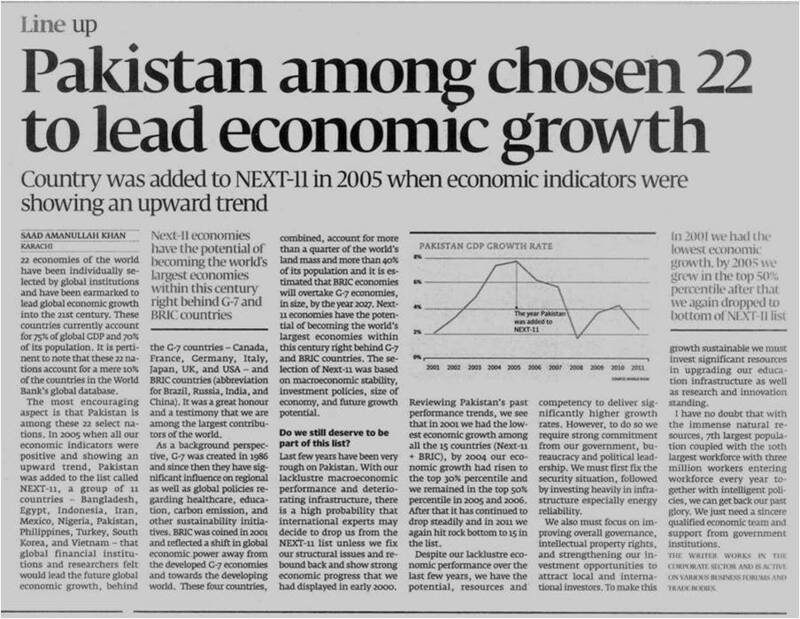 In 2005 when all our economic indicators were positive and showing an upward trend, Pakistan was added to the list called NEXT-11, a group of 11 countries – Bangladesh, Egypt, Indonesia, Iran, Mexico, Nigeria, Pakistan, Philippines, Turkey, South Korea, and Vietnam – that global financial institutions and researchers felt would lead the future global economic growth, behind the G-7 countries – Canada, France, Germany, Italy, Japan, UK, and USA – and BRIC countries (abbreviation for Brazil, Russia, India, and China). It was a great honour and a testimony that we are among the largest contributors of the world. These 22 economies of the world have been individually selected by global institutions and have been earmarked to lead global economic growth into the 21st century. These countries currently account for 75% of global GDP and 70% of its population. It is pertinent to note that these 22 nations account for a mere 10% of the countries in the World Bank’s global database.